Here at Hughston we pride ourselves on delivering the very best in patient care. Part of that process is effective diagnosis of musculoskeletal conditions. Without the proper diagnosis, you don’t receive the proper care; it’s as simple as that. While we utilize a wide variety of diagnostic services, one of our favorites is the use of EMG/NCS (electromyogram and nerve conduction studies). These services are rendered through an amazing organization, EMG Solutions. These guys really provide excellent service. Everything was easy to get started. We’ve been able to keep and ensure patient receive optimal care on premises, which was fantastic! Our doctors love them, our finance department loves them and most importantly our patients love them. We highly recommend EMG Solutions for any healthcare facility. Hughston Foundation is participating in the state-wide fundraising event – Georgia Gives Day! The Summer 2016 issue of the Hughston Health Alert recently won the Award for Excellence in the Newsletters Design and Layout category in the 2017 annual international APEX Awards for Publication Excellence competition. The Hughston Health Alert has placed in the competition every year since 2002, winning a total of 5 Grand Awards in the newsletter category and 11 Awards of Excellence. Congratulations to our Editorial Board members for their hard work and continued dedication to this important publication. Thank you to everyone who came out in support of our annual tournament to support The Arthritis Foundation. If you were not able to join, please do so next year! 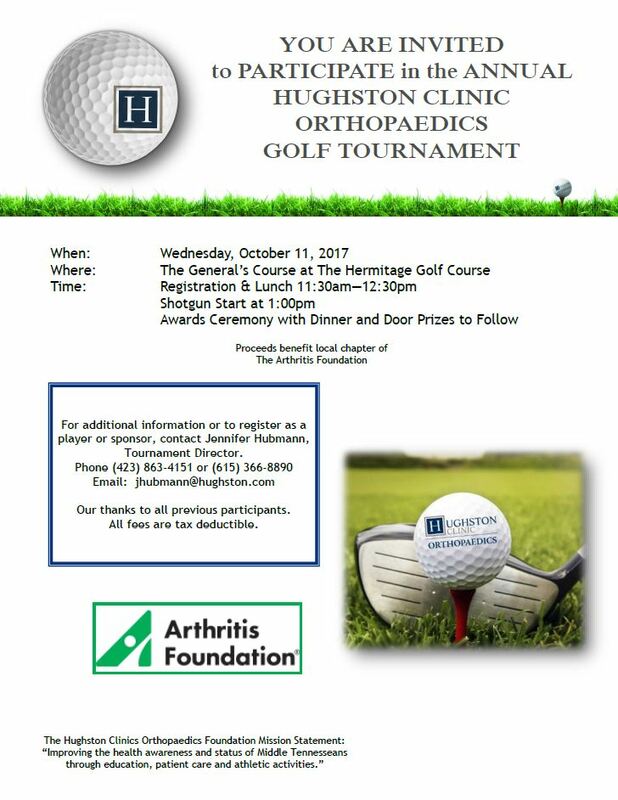 The Annual Hughston Clinic Orthopaedics Golf Tournament will be hosted Wednesday, October 11, 2017 and you are invited! This year’s event will be located at the beautiful Hermitage Golf Course. Registration and Lunch begin at 11:30 AM. For more information or to register as a player or sponsor, contact Jennifer Hubmann, Tournament Director. We look forward to seeing you there! Columbus, Georgia – April 22, 2017- Robert. E. Leach, MD, received a standing ovation as he ended his presentation on the birth of sports medicine and the American Journal of Sports Medicine in Columbus, during Thursday’s afternoon session of the Hughston Society Biennial Meeting. During his invigorating speech, Dr. Leach talked about the history of the American Journal of Sports Medicine and how Dr. Hughston influenced not only the start of the journal but also the role he played in helping to form the subspecialty of sports medicine. Dr. Leach explained that when Dr. Hughston was on the sidelines at football games and treating athletes in his orthopaedic clinic, he was also working with other physicians, 75 in fact, across the country, to form the American Orthopaedic Society for Sports Medicine (AOSSM). Once the association was created, they began looking for a sports medicine journal. Medical journals, at the time, looked down on sports medicine research, and often rejected manuscripts for publication. Dr. Hughston was teaching other physicians and wanted to share his knowledge among his sports medicine colleagues. So AOSSM purchased a journal called the Journal of Sports Medicine, and soon renamed it to the American Journal of Sports Medicine. For these two achievements, Dr. Hughston will be forever recognized as one of the founding fathers and of having been truly dedicated to the field of sports medicine. Dr. Hughston served as President of AOSSM 1974-1975; Editor of the American Journal of Sports Medicine from 1972 to 1990; and Chairman of the American Journal of Sports Medicine from 1990-2001. He also received the Mr. Sports Medicine Award from AOSSM in 1976, which later became known as the Robert E. Leach, MD, Sports Medicine Leadership Award. And with those last words, everyone in the room stood. When Experience Matters…Choose Hughston Clinic Orthopaedics! Get to know Hughston Clinic Orthopaedics physicians. We offer specialized care for all orthopedic needs. Request an appointment today!